The 2019 Toyota Sienna is marketed as the perfect minivan for families and fun. The Sienna comes in seven different models this year. Each version is a four-door vehicle with a rear hatch. It is currently the only minivan on the market that offers all-wheel drive. This vehicle offers plenty of room for both cargo and passengers. If you're searching for the perfect minivan, the Sienna may be right for you. The Sienna really hasn't changed much since 2010. The SE model offers AWD for the first time this year. The four-season package can now be added to four different trim levels. Another addition for 2019 is compatibility with both Amazon's Alexa and Apple CarPlay. Besides these minor updates, the Sienna remains largely the same in anticipation of a complete revamp in 2020. Interior space is one of the best reasons to choose a minivan. The Sienna has plenty to spare. There is around 164.4 cubic feet of space for passengers. This minivan can comfortably seat seven to eight adults. There is ample room for stretching out your legs in the cabin, second and third rows. The Sienna also offers a nice amount of head room. You can get your whole crew to wherever you're going in comfort. Cargo space is another great reason to purchase a minivan. The rear hatch and sliding side doors make loading or unloading cargo easy. The 2019 Toyota Sienna offers 39.1 cubic-feet of storage space in the back. If you remove all of the rear seats, you can get a whopping 150 cubic-feet of space. The Sienna also features what Toyota calls the Split and Stow 3rd-Row Seat. This system allows you to quickly split and fold back the third-row seats for more storage space. The feature is power operated on the Limited trim. If you're looking to purchase a minivan, it's safe to assume you have a lot of passengers you need to transport around. Therefore, safety should be a big consideration for which model you select. The Sienna has you covered in this department. Best of all, most of the safety features come standard on all models. The Toyota Safety Sense™ P system is a whole suite of high-tech features. A lane-departure alert lets you know if you're veering too far out of your lane. A driving-assist system works with this alert to make corrections for you. The system is only engaged while driving 32 mph or faster. A pre-collision detection, pedestrian alert and dynamic-radar cruise control round out some of the top safety features. The 2019 Toyota Sienna only offers one powertrain option. A 3.5 liter, V-6 engine provides plenty of power and good performance. The V-6 is paired with an 8-speed, automatic-transmission system. This engine provides an impressive 296 hp with 260 lb-ft of torque. Acceleration is surprisingly fast for a vehicle of this size. You never feel bogged down with a van full of people and cargo. The ride quality is very comfortable inside of the Sienna. This is in part due to the space and comfortable seats. All three rows of seats are comfortable and provide plenty of elbow and leg room. It's downright quiet inside of the Sienna too. The suspension system does an excellent job of soaking up bumps and whatever the road throws at you. Good ride quality is important for a vehicle that is meant for family transportation and long trips. If you live in an area with harsh winters, the 2019 Toyota Sienna is a good solution. This is the only minivan currently available with AWD. It works in tandem with Toyota's Active Torque Control too. Advanced sensors make sure that the right amount of torque is applied to each wheel. This provides excellent traction in wet or snowy conditions. The Sienna is one of the quickest minivans on the market. 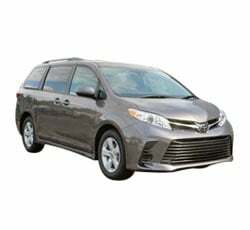 Excellent steering and handling combine with the powerful engine to make the Sienna a joy to drive. Steering is tight and accurate. The vehicle always feels stable with very little body roll. AWD models hug the road even during sharp turns. All of this adds up to a minivan that's fantastic for long trips or daily driving. The 2019 Toyota Sienna has a stylish dash and console that is accentuated with a great infotainment system. The system provides a 7-inch, high-definition touchscreen. Apple CarPlay, Amazon Alexa and App Suite are all integrated into the infotainment system. You can send messages, make calls and use a number of your smart phone's features while safely keeping your hands on the steering wheel. Through voice commands, you can even request news updates and ask the system to play your favorite music. The system also acts as a WiFi hub for all of your portable devices. One great option for the Sienna is Toyota's Dual-View Blu-Ray Disc Entertainment Center. This is a fantastic feature for anyone with children. It's also great for adults, especially on long road trips. The system offers a 16.4-inch, HD display. It can display one widescreen image or two images at a time. These two images can be displayed from completely different sources. Minivans are built to give you plenty of space for passengers and cargo. It's not always easy to unload or load cargo, depending on the design of the vehicle. A lot of minivans can be difficult to get in and out of as well. The 2019 Toyota Sienna solves all of these problems. The rear hatch makes it easy to access the rear cargo area. The lift height is just right so you won't struggle to load or unload your goods. Sliding side doors make it a breeze for passengers to access every row of seats. Most minivans will offer these features, but Toyota's design and dimensions here make everything easier than the competition. It seems odd for Toyota to provide only one powertrain option with so many trim levels. The V-6 engine is really fantastic, but it may not be ideal for everyone who wants a minivan. Some may prefer a more fuel-economy friendly choice from the competition. Many drivers would opt for a V-8 and more power for a vehicle that hauls people and cargo. Unfortunately, you don't get the choice with the Toyota Sienna. The 2019 Toyota Sienna provides plenty of ways to increase your cargo space. You can split the third row for a bigger area to store things. You can even remove the second and third-row seats. Unfortunately, it can be a real chore to do so with that second row. This may not matter to drivers who seldom use this feature. If you do, you'll be wishing it was a bit easier. The exterior and interior styles have not been updated in years. The style of the Toyota Sienna may seem a bit long in the tooth for some consumers. Still, it's certainly not a bad look. Some may take the stance that if it's not broken, don't fix it. If you prefer a more modern look, it may be best to hold off until Toyota does their total revamp of this minivan. It is rumored to take place in 2020. We already mentioned that the 2019 Toyota Sienna has only one choice for an engine. This lack of options shows up in other areas too. Whether it's tech-based features, luxury features or just color choices, the options are sparse. Many competing minivans have a higher level of customization available. This allows owners to build a minivan that suits their specific needs. The 2019 Toyota Sienna has three main competitors this year. These are the Honda Odyssey, Chrysler Pacifica and the Dodge Grand Caravan. The Honda offers a similar V-6 engine, comparable performance and the same towing capacity as the Sienna. The Sienna beats it when it comes to cargo and interior space. The Chrysler Pacifica also offers similar performance at a comparable price. Once again, the Sienna has more cargo space and a bigger interior for passengers. The Sienna offers a smoother ride, AWD and better fuel economy as well. Last of all, the Caravan is basically the same platform as the Pacifica. The Sienna wins out here as well, for the same reasons it tops the Pacifica. The 2019 Toyota Sienna is an excellent choice for anyone looking to purchase a new minivan. It features more cargo space and a larger interior than the competition. It is also much easier to get people and cargo in and out of this minivan. The V-6 offers plenty of power and great performance. Some high-tech features and entertainment options make it a wonderful vehicle for long rides. When it comes to minivans, it doesn't get much better than the Sienna.